Princess Elizabeth's Spy by Susan Elia MacNeal, a Mysterious Review. Review: When Maggie Hope had been Sir Winston Churchill's secretary, she never thought of herself as potential spy material, and yet in 1938, here she was in Bletchley, a small railroad town about fifty miles north of London hoping for an assignment of breaking codes, or parachuting behind the lines in Germany. 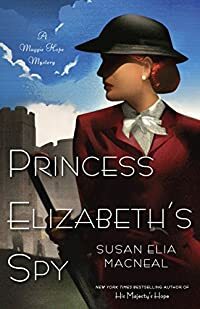 But instead she sent under cover to Windsor Castle as a tutor for a young Princess Elizabeth in Princess Elizabeth's Spy, the second mystery in this series by Susan Elia MacNeal. Maggie knows that during war, all work was important. There are no small jobs or responsibilities. And because Churchill knew Maggie was smart, judicious, and had an eye for the unusual and out-of-place — and was able to put two and two together — he wanted to have her at Windsor Castle to have her keep an eye on things … from the inside. Her cover was to be a tutor in math for Princess Elizabeth, second in line to the throne. The fear was that someone would try to kidnap or kill her, so having someone around would add a layer of protection. But in fact Maggie was to be a "sponge" soaking up any and all information regarding life within Windsor Castle. Little did Maggie know, at the time just how much information there was to absorb. With so many people associated with the royal family, she doesn't know who, like herself, may be undercover at the request of someone else, and whether they be friend or foe. Princess Elizabeth's Spy is a fascinating mixture of fiction and history. The mystery story itself is extraordinary and the rise of Hitler's empire as seen through the eyes of Prime Minister Winston Churchill and others is truly remarkable. But it is Maggie herself that is the star of this show, a smart, strong-willed woman, who knows she has limitations but strives to succeed despite them. Special thanks to guest reviewer Betty of The Betz Review for contributing her review of Princess Elizabeth's Spy. Acknowledgment: Random House provided a copy of Princess Elizabeth's Spy for this review.